When producer Annica Bellander first brought the novel A Man Called Ove to my attention, I have to admit that I was a bit weary. Not only was I thinking about the difficulty of adapting a beloved international bestselling novel to film, but I was also keen to making films from my own experiences and stories. At that point, I was thinking about moving away from comedies entirely, and, at surface level, A Man Called Ove smelled comedy all the way. I left our meeting with a copy of the novel in hand, and out of sheer curiosity, I decided to open the book that evening. Before I knew it, the evening became night and the night turned into morning. 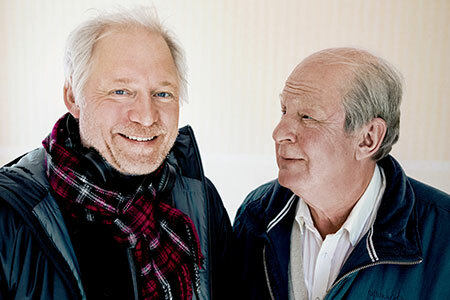 A Man Called Ove isn’t simply a comedy—it’s altogether a beautiful, heartwarming, funny, sad and melancholic tale about a man and his life. By the end of the story, I was moved to tears. A Man Called Ove was one of my best shoots to date. Having the opportunity to develop the character of the stubborn, grumpy old man we all know—whether he’s angrily honking behind the steering wheel in the car behind you, causing a scene at the grocery store, or enforcing the rules and regulations of your neighborhood—was an insightful look at the events in our lives that make us who we are. Ove may come across as an ill-tempered, isolated retiree, but as you delve into his past and watch him form an unexpected relationship with his boisterous new neighbors, you learn that there’s much more to him. Peeling away his toughest layers exposes common experiences of love, loss and heartbreak. Ove is more than the angry solitaire—Ove is each of us. A Man Called Ove is a story that shouldn’t go unnoticed—it should be repeatedly told with different people and environments. Working on A Man Called Ove has caused me to reflect on my own life and work—as a director who only wanted to shoot my own stories, Ove has caused me to look for other people’s stories and perspectives as well. You never know—sometimes you’ll learn something from them!